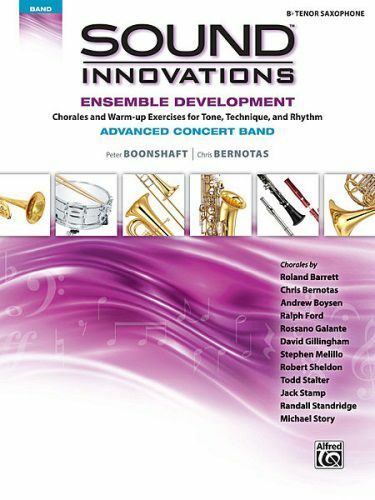 Sound Innovations: Ensemble Development for Advanced Concert Band builds upon the concepts in Ensemble Development for Intermediate Concert Band with 399 new exercises that are more technically and musically challenging, including over 70 chorales written by some of today's most renowned composers for concert band, including: Roland Barrett, Chris Bernotas, Andrew Boysen, Ralph Ford, Rossano Galante, David Gillingham, Stephen Melillo, Robert Sheldon,Todd Stalter, Jack Stamp, Randall Standridge, and Michael Story. This book is a valuable resource in helping students grow in their understanding and abilities as ensemble musicians. Exercises are grouped by key and presented in a variety of intermediate to advanced difficulty levels. Where possible, several exercises in the same category are provided to allow variety while accomplishing the same goals. Its flexibility makes it perfect for large ensemble rehearsals, lessons, and studio use.